Go to http://boldbravemedia.com/a-call-to-heal/ and click on the ”Listen Live” tab at the top of the page. Through connection with Infinite Awareness, the co-hosts, Julia and Karolee, bring forth information and energetic clearing, attunements and activations to its listeners, to literally enable them to change their lives. Karolee and Julia read the energetic bodies of the caller through channeling information in the form of visions, words, and feelings. A lot of fun and energetic change happens as listeners tap into past lives, inner child energy, and future lives. Encounters with beings- angels, elementals, ancestors, Masters and Light Beings add to the powerful exchange. Listeners are encouraged to call in for specific individual healings that will affect everyone on the call, as we are all connected energetically. If you are seeking freedom, health, abundance, bliss and are looking to change your life and this world, this energetic show can be the impetus to assist you in creating the reality of your dreams. Whether you listen live or to a recording, the energy and information will have an effect on you, as there really is no time and space. Julia Stubbe and Karolee Schloth are two extraordinary energy movers and intuitive channels that have helped many heal their bodies and change their lives. When these two healing forces combine their energy fields, watch out, as powerful things happen. Together, these two women have co-hosted The Energetic Toybox, and now A Call to Heal, as well as lead individual and group energy healings. A Call to Heal: Listen Now! Each show started out with guided imagery, setting sacred space with love, joy and expansion. 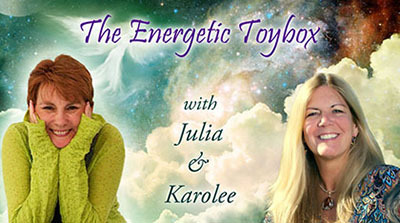 Each week we took a peek into the Energetic Toybox to bring out a metaphysical tool or concept and played. We explored fundamentals of the metaphysical world for alternative and holistic healing. If you have little or no knowledge of these concepts, or just want to review the basics, we provide a foundation and the tools to give you the confidence and hunger to explore on a deeper level, empowering you on your spiritual path with joy and enthusiasm.